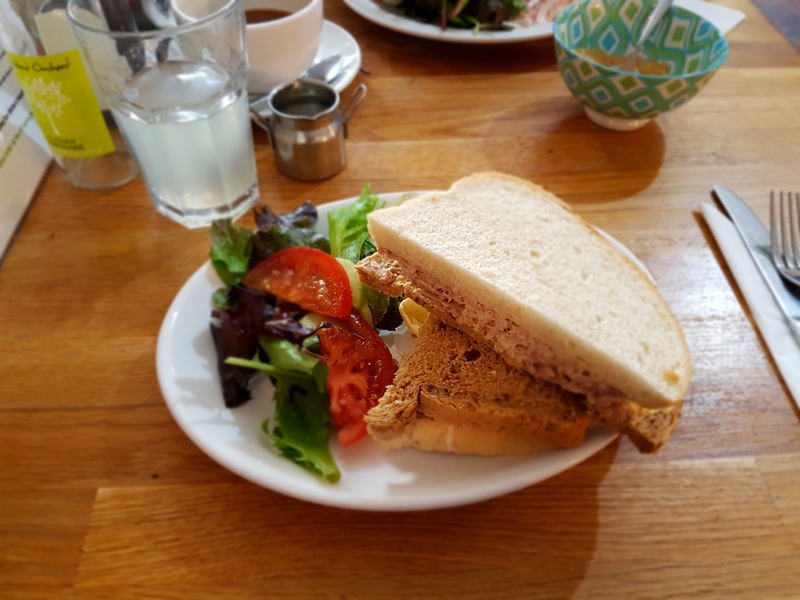 When I posted my Cirencester town guide I spoke about Swan Yard and Blackjack Street which are a couple of little side streets in the town, the former was home to the Swan Yard Cafe which was one of my favourite cafes. It closed a few years ago, changed hands, got a new menu, new layout and a new name, and, I didn’t go back after that. I had nothing against the place, the layout and decor looked great and I hadn’t even tried the new menu which sounded great too, but I didn’t go back. I don’t like change and that’s probably the only real reason I have for not going back. I like familiarity. With that said, I decided to try their food recently and it was delicious. I felt like a fool for putting off going back there for so long. We chose a table and after a quick look at the menu went to order our food and drink at the counter. Dad ordered one of their ‘quiche of the day’ specials which was roasted vegtables and a white coffee, I ordered a tuna mayo sandwich and a diet coke, which they didn’t have. We both ordered a side of bread and butter to go with our meals. LBs source their ingredients from locally suppliers and family businesses where ever possible so it makes perfect sense why my usual soft drink (the aforementioned diet coke) wasn’t on the menu. The young lady behind the counter told me they had cola or if I wanted a diet drink they had doet lemonade. I chose the lemonade and am so glad I did, it was perfect. 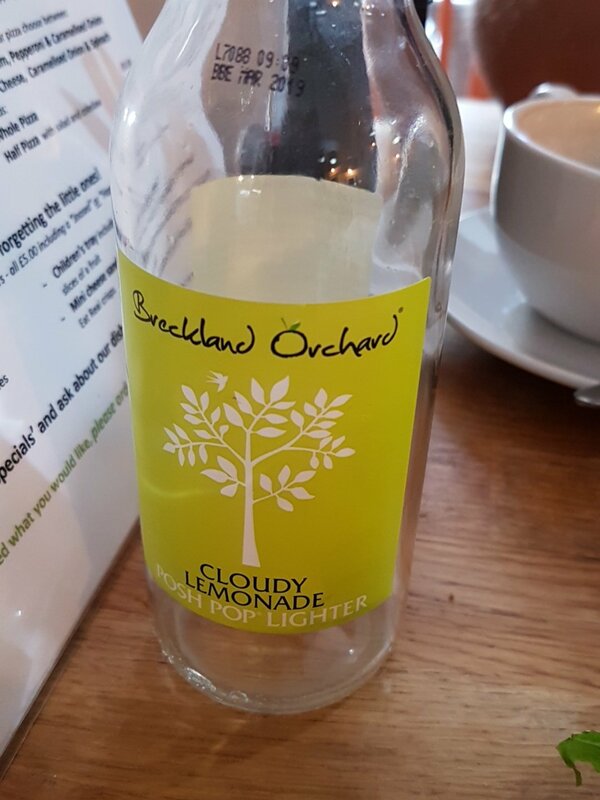 Breckland Orchard, not a company I’d heard of before but found them on Twitter so I could learn more and I’m going to buy a pack of their lemonade on-line which is roughly £20 for a pack of 12 bottles. Our drinks arrived first and followed shortly after by our food, the presentation was amazing and I liked how my sandwich was half and half – I’m not sure if you can see in the photo but the top slice is white bread and the bottom slice is brown bread. It was served with a side salad and some crisps where as dad’s quiche was served with a pasta salad. The bread used for my sandwich was delicious, really soft and I assumed from a fresh farmhouse loaf. So even though the Swan Yard cafe is no more, I’d highly recommend LBs cafe for lunch and at a little under £20 for two people is affordable and reasonably priced in comparison to other lunches available in Cirencester. On behalf of the Management of LBs I’d like to thank you so much for a wonderful review of our little eatery. Loobys Bunch have worked very hard to deliver a happy and satisfying food experience and we are so pleased that as an old regular you enjoyed our food. We hope to see you again soon! I adore independent cafes/restaurants! They’re always so much more fun to eat/drink in than the usual chains! This sounds like a fantastic cafe! I love that they use both white and brown bread for their sandwiches – I bet that was amazing! Glad you enjoyed the experience and the lemonade!